Fuji Clean Co Ltd. was established in 1961 and have continuously developed their range of wastewater treatment products over the past 50 years. To date FujiClean have installed over 2 million Jokaso and are the industry leader in Japan with a market share of 34%. Now operating globally (Asia, Australia, USA & EU) FujiClean are working towards providing everyone with access to the most reliable & cost effective system for onsite wastewater treatment. In 2006, the Japanese Ministry for Environment reported that nearly 11 million citizens were being serviced by Jokaso technology in Japan. As a market leader FujiClean continue to install 50,000+ systems per year. Fuji Clean Australia Pty Ltd was established in 2008 as a subsidiary of Fuji Clean Co Ltd. Initially all systems were imported directly from Japan up until January 2010 when domestic system manufacturing commenced in Coomera, QLD. Commercial systems are still imported from Japan, with stock being held at Coomera, QLD and Perth, WA. Our most popular domestic model the CE-1500EX has gained approval in all states of Australia easily achieving the highest treatment class – Advanced Secondary with nutrient removal. This treatment class allows for the most effective use of recycled effluent. 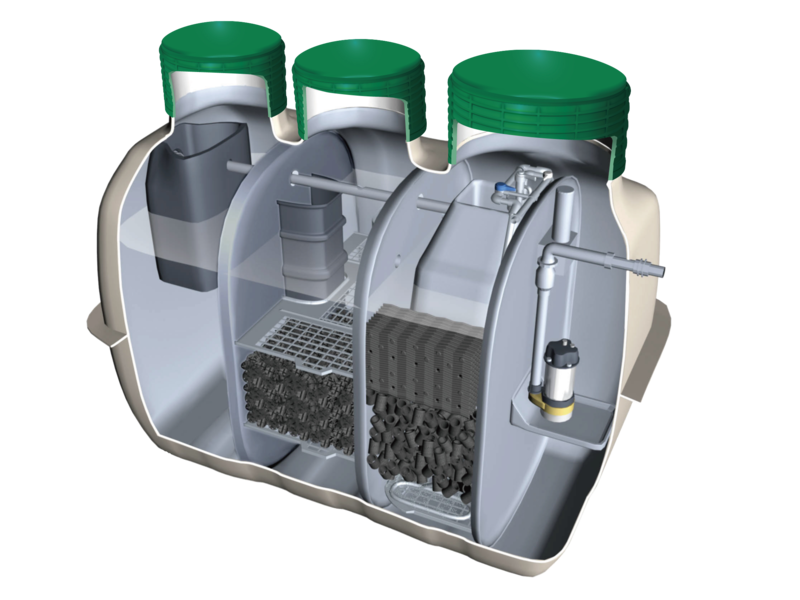 Compact - Lightweight single tank design reduces transport and installation costs. Once installed it has minimal visible components. Efficient - No moving internal parts and energy efficient electrical components result in low running costs. Proven design - FujiClean have over 60 years’ experience developing wastewater treatment technology. FujiClean has system approval in all states of Australia and exceeds current testing parameters for treated water quality. Sustainable - Extended service life with minimal environmental impact plus the ability to reuse recycled water for garden and lawn irrigation. Safe & Secure - Complete treatment process is contained inside tank with alarm monitor protection against system failure. Systems produce high quality treated effluent minimising health risks. A compact lightweight single tank design with a minimal footprint & visuallu discrete installation. Australian manufacturing using dependable components with high quality performance. Safe and secure with alarm protection & the entire treatment process carried out inside the tank. Efficient processes and procedure with a natural treatment process, low operation and running costs. FujiClean have over 2 million systems already installed and continue to install 50,000+ systems annually. Industry standard warranty of 15 yrs – structural tank warranty and a 2 yr warranty on the electrical components. 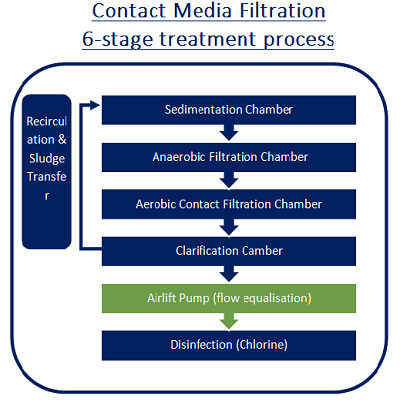 Contact Media Filtration – A 6 Stage Treatment Process. Combining these techniques allows for optimum treatment to be carried out in the most efficient amount of tank space. The effective operation of the system is dependent on regular maintenance. It is to be serviced EVERY 3 MONTHS by a Fuji Clean authorised service agent. NS energy is your local service agent. Regular maintenance involves periodic removal of excessive sludge and scum build-up from the system. The frequency of removal depends on the system’s loading. Keep your household’s water usage below the system’s daily design flow rate. Try to wash laundry in stages over several days. Do not switch off the power to the system even if you are going on holidays. If extended periods of non-use are anticipated, contact your service agent. Do not use excessive amounts of detergents. Do not put fats and oils down the drain and keep food waste out of your system. Do not put bleaches, disinfectants, whiteners, nappy soakers and spot removers in large quantities into your system via the sink, washing machine or toilet. Do not allow foreign objects such as sanitary napkins, nappies, tampons, pads, condoms and other hygiene products to enter the system. Do not use water bluing substances in the toilet as these are poisonous to the beneficial bacteria. The list below shows examples of chemicals which are considered harmful to the system. Solvents like dry-cleaning fluid, nail polish removers, glue solvents, perfumes etc. Motor Oil, Petrol, Antifreeze, Break Fluid and Other Automotive Fluids.